← Did PAP also lie about public housing subsidy? If PAP fails to pull this through, ie convince educated Singaporeans that ‘lessees’ = ‘owners’, there will be severe repercussions. For a start, lessees do not pay property taxes. Neither do lessees need to pay high conservancy fees to maintain public property, ie playgrounds, open spaces, void decks, etc. Worse, from being a country with one of the highest ownership rates, Singapore will drop to rock bottom. No joke. This issue has been confused with one between leasehold vs freehold property. It is not. Many Singaporeans have still not realized that legally, we have never been owners – HDB flats cannot be used as collateral for a mortgage loan. It is silly to believe that one could be a property owner without ownership rights. The right to transact a lease should not be confused with property ownership. For readers who are not familiar with this issue, you can read my other posts here. 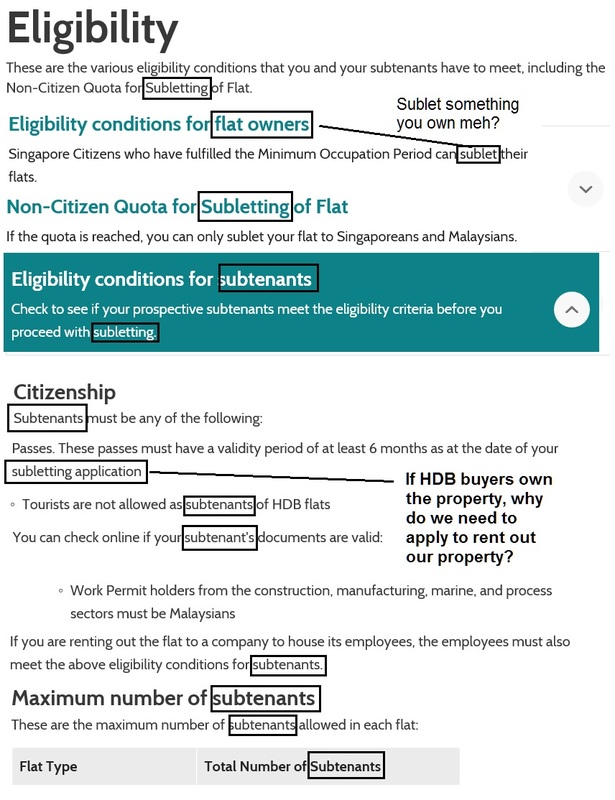 HDB could not have confused “subletting”, “sublet” and “subtenants” with any other words. Recently, HDB decided to ‘resolve’ the ownership issue once and for all … by amending its website. For example, “subtenants” has been amended to “tenants”, “subletting” is now “”renting out”. Amended website below. It is foolish to assume that “lessees” will automatically believe that we are “owners” by HDB playing with words on its website. The only way for HDB lessees to become owners: give us all ownership rights. MSM is no longer king and thinking Singaporeans have had enough. HDB should just stop lying to the people. Pls see HDB’S latest reply. HDB continues to lie. Without the transfer of strata titles, inability to use flats as collateral, etc we only own a lease, not the flat. HDB has always referred to buyers as lessees in the Lease Agreement and itself as lessor.